Until today continuous work-travels to Canada, USA, Mexico, Thailand, Australia, India, Hong Kong, China, Chile, Belarus, Russia, Brazil, Argentina and European countries. 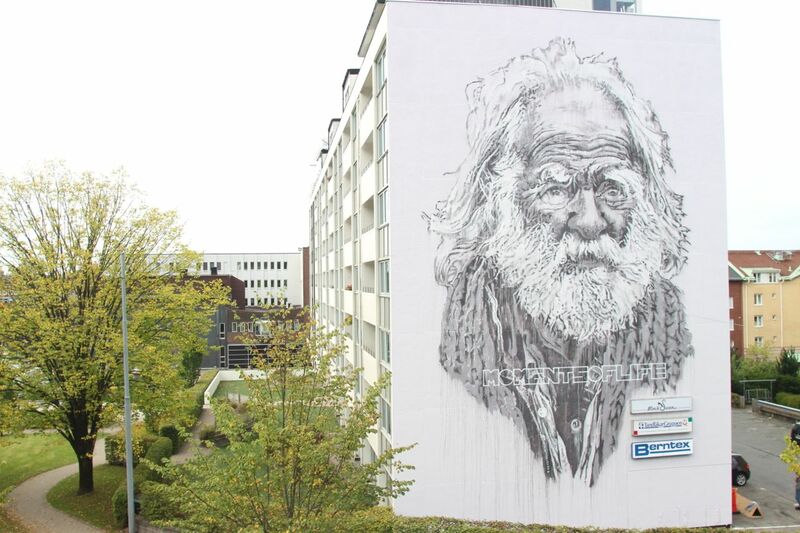 Hendrik ecb Beikirch is well known for his brilliant black and white portraits painted either on canvas or on large buildings. His highly poetic portraits often depict people from the immediate neighborhood appearing strange and familiar at the same time. Even though dedicated to a meticulous realism, he sometimes likes to distort his portraits by either stretching or compressing them. Moreover, the dripping technique, making single paint drops to run down, is a distinctive feature of many of his works. Yet even these alienating effects may not curtail their realist intensity in any sense. Increasingly, his works in public space take on an almost utopian scale turning the painting process into a bold venture. Only in August 2012 he created a 70-meter-long portrait of a fishermen in Busan, South Korea, now being Asia’s highest mural.